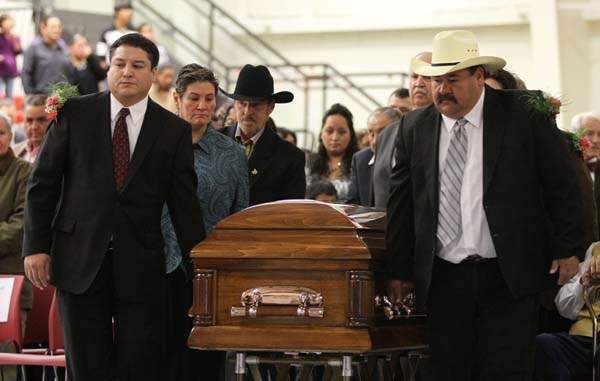 BROWNING — Lifelong friends and government dignitaries joined the family of Elouise Pepion Cobell to celebrate and honor her life at a funeral Mass on Saturday in the Browning High School gymnasium. Cobell, 65, died Oct. 16, six months after being diagnosed with cancer. Her battle with the disease was the latest fight waged by a woman whose life was marked by unyielding pursuits for causes she believed were just and right. "She was the head of the Wolverine Club," James Scott, Cobell's friend and the vice chairman of the board of directors of First Interstate Bank, told the crowd of more than 400 attendees. "And you know if you get in a fight with a wolverine, you better be ready for a long one." Cobell knew what she was getting into when she and four others filed a class-action lawsuit against the U.S. government in 1996 that claimed the Interior Department misspent, lost or stole billions of dollars meant for Native American land trust account holders dating back to the 1880s, said Dennis Gingold, whose Washington, D.C., law firm represents the case. It took 16 years to reach a $3.4 billion settlement, and delays continue in the payments outlined in that settlement. Cobell told Gingold that his firm was her last chance to bring the suit. "She said, however, there was one condition," he said. "We could not file the suit unless we agreed to finish it." Cobell lived to see the finish line of the case, but couldn't cross it, he said. "To honor her, you and I must complete what was started," he told the crowd. "Justice requires it." Larry Echo Hawk, the Interior Department's assistant secretary for Indian affairs, read a letter from Interior Secretary Ken Salazar that said Cobell was "a significant force for change. She is a hero in all senses of the word." Cobell's work inspired the nation to do better by its first Americans, Salazar wrote. All U.S. Department of Interior flags will be flown at half staff Monday in her honor, Echo Hawk said. The lawsuit brought Cobell national recognition. She received a $300,000 "genius grant" from the John D. and Catherine T. MacArthur Foundation in 1997 and used most of the money to help fund the lawsuit. Saturday's ceremony also highlighted many other aspects of Cobell's life. She was born on the Blackfeet Indian Reservation on Nov. 5, 1945, with the Indian name Yellowbird Woman, the great-granddaughter of famous Indian leader Mountain Chief. She was one of eight children. Her survivors include her husband, Alvin Cobell; a son, Turk Cobell and his wife, Bobbie; two grandchildren, Olivia and Gabriella; a brother, Dale Pepion; and three sisters, Julene Kennerly, Joy Ketah and Karen Powell. An early entrepreneur, a 10-year-old Cobell and friend Zita Bremner sold horseback rides to tourists at the Birch Creek Campground, Bremner recalled during the eulogy. As an adult, Cobell helped open the Blackfeet National Bank in Browning after the only bank in town went under, and efforts to attract a new financial institution were unsuccessful. "She had a vision of the role of a bank in our society," Scott said. "That is what was the start of our friendship. She understood that the economic health of a community depends on having a financial institution where money is pooled." Financial education was a lifelong mission for Cobell, he said. She founded the original mini-bank in Browning, a youth financial organization that includes a board of directors made up of elected young people who set policies and procedures. "Today, we have mini-banks from Polson to Poplar, with 1,200 student bankers and $1 million in assets," Scott said. Philanthropy was another of Cobell's pursuits, he said. She was inspired by the work of the Montana Communities Foundation to create a permanent endowment on the Blackfeet Reservation to fund community projects, Scott said. Today, the Blackfeet Community Foundation, funded by proceeds of the annual Harvest Moon Ball and other sources, has $360,000 in its endowment. Cobell, Scott said, also was joyful, with a twinkle in her eye. Bremner said that as youth, the pair had their siblings deliver notes to each other's houses, located a mile apart. "We had to send them in our secret code because they (the siblings) were bratty and nosey," Bremner said. Cobell was an Elvis Presley fan and life-size cutouts of the singer were in the back on both sides of a stage set up for musicians Saturday at the service. "Yesterday, the Browning radio station played Elvis music all day long in her honor," said Carol Juneau, a former state legislator from Browning. "I never knew it, but Elvis was one of her favorite people." On trips from Valier to Browning, a young Cobell, usually listening to Elvis or Patsy Cline, would stop her car, yell "Chinese Fire Drill," then expect all of the passengers to get out, run around the car, then jump back in, Bremner said. Cobell was dedicated to her family, putting college on hold for a time to return to her family's Birch Creek ranch to help her mother when she was ill, Bremner said. "It was an inspiration to watch her raise her son and see what a fine man he's become," Bremner said. Turk Cobell thanked the attendees Saturday for their support through his mother's illness and the tributes extended after her death, including a processional held through Browning on Friday when Cobell's body was brought to the high school for a rosary service and all-night wake. "I have never been more proud of Browning," Turk Cobell said. Those who worked with his mother — as well as those who worked against her — knew she never passed up an opportunity to speak about causes she knew were just, he said. "She always spread the word, stood up for people who can't stand up for themselves or when there was a need that was unmet," Turk Cobell said. "Many times, those speeches were met with a standing ovation. "Won't you join me with one final standing ovation for her," he asked. A packed Browning High School gym then collectively stood, applauded and cheered for Elouise Cobell.